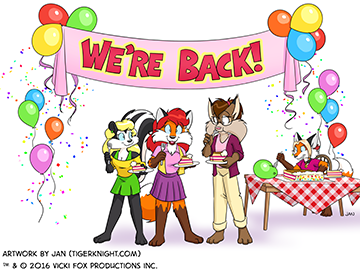 With the start of 2017, we are pleased to announce our long hiatus is over and ... WE'RE BACK! Hi, I'm Vicki Fox! I'll be your host as you explore this site. Explore our entertainment options, including a comic strip featuring me, friends, and relatives. And, be sure to check out the many things in between. Please use the Vicki Fox Facebook page for comments and sharing media. Meet me, Vicki, and the comic strip cast. Learn about the artists behind the comic strip. Visit the art and video galleries. Answer your question on the FAQ page. Learn about our copyright and trademarks, how to license the characters, and our new brand, Dixie Wildlife. Read the current comic strip, and catch up on older strips in the archive. Learn about the Minding the Gap series and other comics we've published. Support our work. We offer Christmas Cards and other products via Cafe Press. We like foxes. Explore some fox facts and appearances of foxes in literature, in film and animation, and in culture. Visit real foxes from Prince Edward Island and Oklahoma. There is more than just the comic strip! Read some good news. Look at our animation art collection, embroidery projects, and puppets. See our vacation pics. And, visit some similar sites. Learn about Vicki Fox Productions Inc. We provide various services and write articles for publications. Contact us to learn more.